She had placed her cat’s food just outside on the front porch. Usually, it isn’t much of a problem. Her cat will wander up when he’s hungry, grab his tasty meal, and wander off to explore…but this time, things didn’t go exactly as planned! 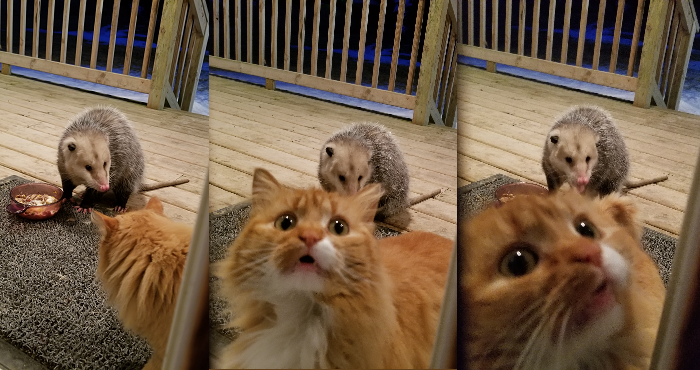 When he came up to the porch for his meal, he realized that another creature had beat him to it! 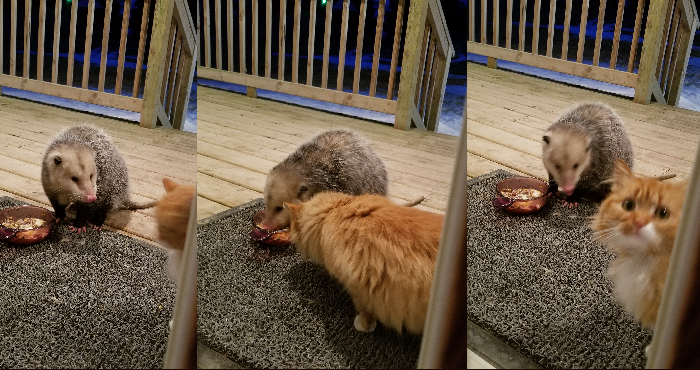 A lonely possum had waddled onto the deck and was helping herself to his meal! The cat didn’t know what to do. His food was being stolen…and his human wasn’t doing anything about it! He could have handled it on his own…but when he got too close to the intruder, he found himself too nervous to do anything about it. He tried to sniff out if he would be able to drive the intruder away…but he couldn’t. The possum protected “her” meal with ferocity, and the cat just hoped it would all be over soon. We can’t be sure what happened next, as there was no update to the post about the poor cat that had been robbed, but we like to think that he got a second meal after his “new friend” wandered off!